Martin Truex celebrating his win on Sunday. Credit: Christopher Hanewinkel, USA TODAY Sports. Martin Truex Jr. is on fire. 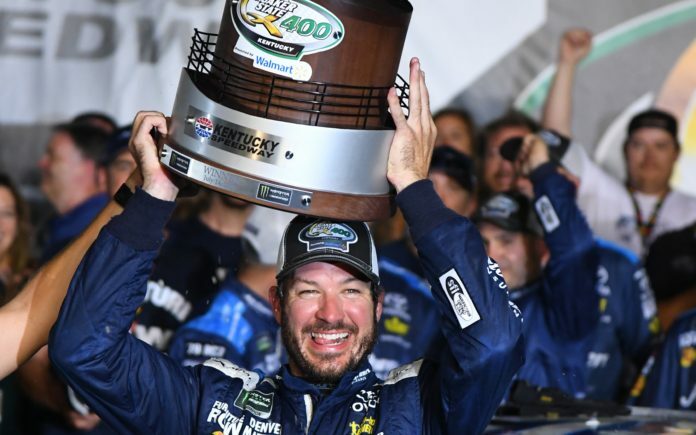 At the Kentucky Speedway this weekend, Truex first won the pole on Friday, he won the first two stages of the race on Sunday and then won the entire Quaker State 400 at the end of the day. Over the course of the race in the Bluegrass State, Truex led for 174 of 267 laps, including the last 44 laps in the victory. It was also the Denver-based Furniture Row Racing team’s fourth win of this season. The overall dominance this weekend by Truex meant his gaining a maximum of seven points this weekend, and is currently third overall in driver and playoff points. In the last nine races, Truex has three wins, three runners-up and eight top fives per a release. Next up for Truex is a race next Sunday, July 22 at the New Hampshire Motor Speedway. That race begins at 12 p.m. MST on NBC Sports Network.